and challenging industry leaders Visa and Mastercard. 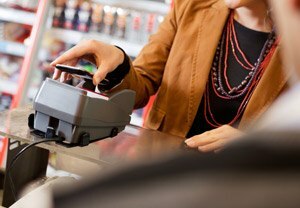 As more people pay for purchases with their smartphones and tablets, the public is demanding more card terminal options and greater security from transaction processing companies. For years major processing companies like Visa and Mastercard have faced little competition, and were free to change processing fees as they chose. But today new players like MCX are challenging their leadership by offering card payment processing services that are better adapted to smartphones and tablets. MCX was launched in August 2012 with the stated mission to offer better consumer data protection as well as lower processing fees and other accommodations for mobile shoppers. MCX models its approach on that of Paypal, the most successful online payment processor. The company’s entrance into the market poses a direct threat to Visa and Mastercard and could force lower processing fees across the board. Paydiant is another new challenger in the payment processing business, having developed a reputation for user friendliness. Competition between MCX and Paydiant, along with more established online payment providers like Paypal and Google Wallet, will contribute to the reshaping of mobile payment processing. Regardless of which of these new players succeeds in dominating the new world of mobile online payments, consumers are likely to enjoy faster, more secure transactions with their mobile devices.